Most hockey fans are fixated on the ongoing Stanley Cup finals between the San Jose Sharks and Pittsburgh Penguins. But at another competition a bit farther south, the members of Team Brazil—a group of misfits and weekend warriors mostly plucked from the country’s in-line roller-skating leagues—are focused on some of the simpler aspects of ice skating. Like, for instance, ice skating. Brazil’s hockey team was formed in 2014. It is part of the Brazilian Confederation of Ice Sports, which also supports national curling and bobsledding, among various pursuits. But other than the affiliation itself, any official privileges are slim. The group doesn’t have any sponsors, let alone a home rink. In fact, there aren’t any regulation hockey rinks in all of Brazil. There was once a small ice patch at a Pizza Hut in the ’90s, but it closed down. Some team members practice skating moves at a tiny rink in a mall in Rio, but they have to share it with children and aren’t allowed to shoot pucks. The ice-deprived players, as a result, have been falling in Mexico City—a lot. Luiz Paulo Serrano de Araújo, a 21-year-old engineering student from Rio, had never skated at an official rink. He had to borrow skates from a friend. 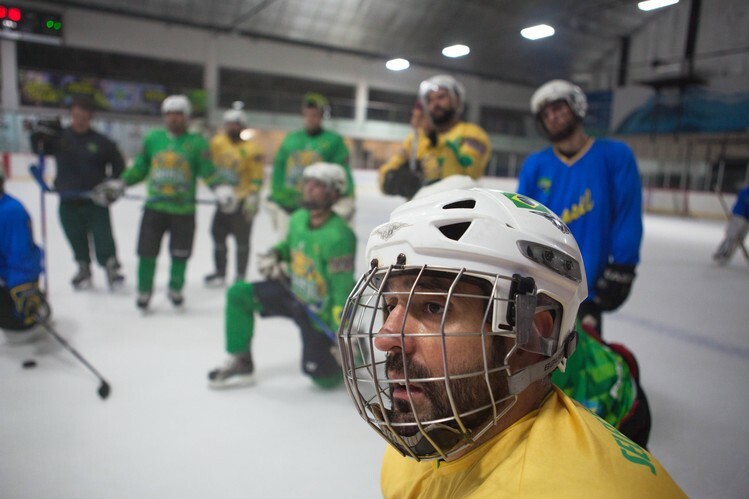 Pedro Prado, 39, the oldest player on the team and a theater actor in Rio, also claims to be one of the best ice skaters in Brazil. He has been teaching some of the new players techniques for stopping on ice. “There’s a trick I use when I’m teaching kids: breathe, exhale, then brake,” Mr. Prado said. Bruno Gomes, 36, plays left wing and is another of the team’s veterans. In the six years since he first tried ice hockey, he has skated on ice a total of six times. Mr. Hinderlie, 35, played a bit of hockey when he was younger—going as far as the Appleton, Wis.-based Fox Cities Ice Dogs of the Great Lakes Hockey League. He also coached junior teams in Juneau, Alaska. But he didn’t plan on continuing with hockey after meeting his Brazilian wife, Gabriela, on eHarmony and moving to her home country. Once they arrived, though, and knowing her husband loved hockey, Gabriela reached out to the Brazilian Confederation to see if they had any job openings. As it happened, they needed a coach for the just-formed hockey team. This will be his second year as coach. He concedes that the tournament is as much about attracting a potential sponsor and raising the funds to build a rink as actually winning games. He, along with team member Daniel Baptista, a 29 year-old investment banker who spent a bit of time in Canada and learned to skate there, is confident the game could catch on if they had a rink in Brazil. Even though Mexico City has several official hockey rinks, the tournament site can present other logistical challenges. Last year at the Mexico City Ice Dome, a compressor failed and the rink was shrouded in fog during games. At the first Pan-American tournament in 2014, the Brazil team, then nicknamed The Intrepid Colossus, lost every game. By a lot. They were defeated by Mexico 16-0, to Canada by the same score, and to Colombia 14-0. At this year’s tournament, Brazil beat Argentina’s “B” team in its first game 8-1, but lost to Mexico 4-0 on Tuesday. In the meantime, as they continue to work on the basics, Mr. Prado, the team’s elder statesman, believes the hard work is already paying off.